What can person "in brief" write about dog, which has conquered its heart and on image of this dog must be valued all other dogs (without any chance on success)? First, mark in newspaper - ode of one huntsman to super dog: the strongest, the most gallant, the cleverest. Then - exterior: looks like pig, white, with small eyes, ugly. The reaction of my wife: this monster will never enter my house! However, it entered. Move that it was such small. Because of it's short (while) legs bull terrier couldn't go upstairs and so it hung by its thick "milk" paunch on stairs. Two months later. Our dogge ( female ) had heat. One German spitz comes to us constantly (uninvited). Since it's besexual, obviously, it would like force our "piglet". 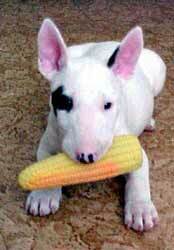 We have outlived our Putel's (it's name of bull terrier) first fit of fury . It began from high piercing wail, which soon became in uterine wail . The spitz went away and we have voiced our approval. After three months. Putel attracted attention of old Olfie (the mongrel of sheep dog), recognized as "king" of area. This bully used one highly mean way to humiliate its enemy: when that lay on back, Olfie ... urinated it. In the same way Olfie has insulted our peace-loving "piglet". "Piglet" is friendly, but has pricked its ears, has battened the tail high , no "wool up". Olfie's Second attempt was terminated by victory of Putel. Length of fight 0,2 seconds. Olfie jumped up and ran away, persecuted by our "pig". 2000 shillings have been paid as insurance (the plates, the vases, the goblets, the table). I'll let me to describe Putel's lines of nature : it isn't a brave dog (if bravery - that quality, which allows us not to realize the danger), but it is unbelievably gallant. It must study everything, what it is afraid of. It's, for instance, deep pits, into which it must climb down, it's - crawling caterpillar, on which it must certainly approach . It is decent temperamental dog and only can play with other dogs not too much time. Then word for word... and deal ends by the veterinary. It needs love: its favourite site is lap (my, my wife's, my son's). It's very sensitive: one rough word in family forces trembling dog to low the tail. It hates the fights and evades them. After fight it - though the winner - feel itself deeply wretch and needed consolation. We had a serious talk with him, when it was one year old . Hereon it realized that it stands first on social stairway - right after me, my wife and our son. At two years old it tried to explain us , that it isn't without fail to prepare its food apart: it has decided that it can eat the same food that we eat. However it had separate menu. Beginning of holidays became a torture for us . Dog, which usually (even before ladies!) went out first from the doors, stood at threshold: the head is lowered, ears hung, tail hungs, everything hungs. Entailment itself of a grief. In general, holidays changed into something strange. My wife requires absolutely serious at hotel, that I place a valise on her legs. So she sleeps better . This reminds her our "pig", which, in spite of categorical prohibition, climbs up the bed as soon as the light off. Apropos, about valise. Putel tried to stop first holiday, for what it lied in revealed valise in hope that nobody won't see it and close the valise. "... Putel has died last night . We are still absolutely unnerved, I'm still crying. We were at veterinary with him. Putel layed in the basket in veterinary's cabinet, breathed gravely and was without consciousness. We sat on bench in the next room... and waited, while veterinary would cure a pair of horses in South Austria . Putel was already dead, when he finally returned. It was the best dog, which I have ever known, not because of qualities, which usually valuable in dogs: it fought not so good, as other bull terriers, it fought bad and multiple scars on its skin proved this. The fight was fetch and self target for it. Also it wasn't guard, protecting things, which didn't belong to him, it didn't have that, what must be in the dog - especially in bull terrier. But it had a lot of glamours. The quality, which is so difficult to describe. It was my friend, in general or, better to say, I was its friend and it loved me. But who not a hero for his valet?"